Peterborough winger Nathaniel Mendez-Laing is aiming to prove a personal point by helping to drag the London Road club out of relegation trouble. The 20-year-old is back at Posh after being loaned to Portsmouth following an incident in Peterborough city centre. 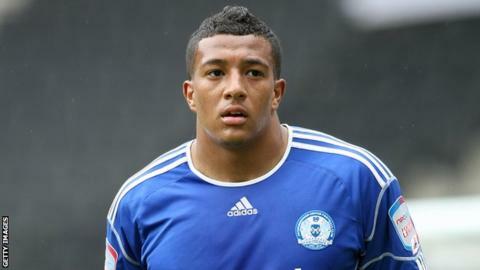 Mendez-Laing was cautioned by police and then fined and transfer-listed by the Championship club. He told BBC Cambridgeshire: "There's a bit of fire, I want to prove people with a certain picture of me wrong." Mendez-Laing was one of four Posh players involved in the incident last November. Peterborough manager Darren Ferguson was particularly frustrated Mendez-Laing, Gabriel Zakuani, Tyrone Barnett and Emile Sinclair decided to go out hours after - a result which left them one place off the bottom of the Championship. After playing eight games for League One Portsmouth, the former Wolves trainee is now back in Ferguson's plans, coming on as a substitute as Posh recovered from conceding a first-minute goal to secure a 2-2 draw at home to Burnley last Saturday. "It feels good to be back and involved. I've had quite a while away, getting some games in, but I've learned quite a bit," said Mendez-Laing. "People do forget I'm still young, I'm only 20. I know that no matter where I go, in Peterborough gear or my own, I represent the football club and I always have to be on my best behaviour. "It's possible to get out of it [the relegation zone], we all want to be in the Championship next season, and anything I can do I will." Mendez-Laing knows a good performance against promotion-chasing local rivals Leicester City on Saturday would go a long way towards winning over Posh supporters - and is convinced the in-form Foxes can be beaten. "They've won five on the bounce, but we've beaten Cardiff, we've beaten Wolves and I don't see why we can't do it again."